- Publisher Based on the comprehensive "Worldwide Perspectives, this briefer study looks at God's work in the world through the same dynamic perspectives as the larger edition. Designed to mobilize God's people to connect their lives to His Kingdom purposes, "Perspectives Exposure explores God's unchanging purposes and investigates how His global plan is unfolding in our generation. Ideal for individual study, Sunday-school classes, short-term team preparation, church-based training institutes, or interdenominational courses, this thought-provoking material develops global vision in practical and world-changing ways. Based on the comprehensive "Worldwide Perspectives, this briefer study looks at God's work in the world through the same dynamic perspectives as the larger edition. 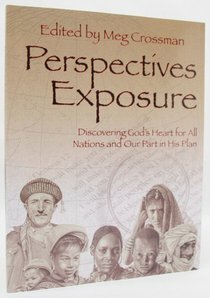 Designed to mobilize God's people to connect their lives to His Kingdom purposes, "Perspectives Exposure explores God's unchanging purposes and investigates how His global plan is unfolding in our generation. Ideal for individual study, Sunday-school classes, short-term team preparation, church-based training institutes, or interdenominational courses, this thought-provoking material develops global vision in practical and world-changing ways.